Rosie and Ti were closer than sisters: that was the trouble. Rosie thought "It all started with a poo in a flowerbed" but there were warning signs long before that, signs Ti was going too far, signs Rosie was losing control. 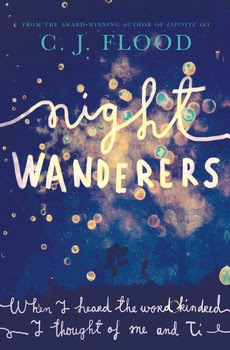 Night Wanderers ventures to the edge of sixteen where parental boundaries are just suggestions, where sneaking out at night is a right of passage and the adventures that follow about the adrenaline rush. And then some. But when do you know a joke has gone too far? And how do you say "no" to your best friend? When Ti and her sister can't be found, Rosie struggles with the feeling she contributed to their disappearance. Rosie takes us through the spot fires of her friendship with Ti and into the eye of their storm. I couldn't turn the pages fast enough to find out what really happened. I guess I didn't trust either Rosie or Ti enough to believe they would reveal all. I'm so glad they did, even if I didn't expect their final words. Night Wanderers: about so much more than friendship.